Experiencing a Professional Football Club | RIASA Student-Athletes | York City & Falkirk F.C. Richmond International Academic & Soccer Academy (RIASA) | Earn a US/UK-accredited degree in a professional UK soccer environment. Thanks for watching this video, we hope that you subscribe to keep up with live fixtures, highlights, vlogs, behind the scenes and more! 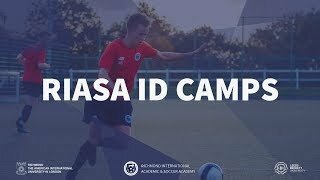 RIASA is the only programme of it’s kind in the world, offering student-athletes, mainly Americans, the opportunity to study for a dual-accredited US/UK degree whilst playing soccer in a professional UK soccer environment in Leeds. Meaning that they can pursue their ambitions in soccer with a respected, reliable and transferable degree to fall back on if their path doesn’t lead to the professional game.